Friends often ask me, “what’s the most important thing to change about my diet?” I tell them to eat the right kinds of fat. This has been the biggest shift in my cooking. I’ve learned that fat is not the enemy. In fact, every cell in your body needs good fat to survive and thrive. So why then did I avoid it like the plague for years? The health community touted the low-fat diet as the be-all, end-all for years and I absorbed every piece of nutrition advice from the media. I think the general consensus for women particularly is to limit fat until we cave and have to eat a whole pan of brownies (What? Don’t act like you’ve never done it.) Documentaries like Forks Over Knives fed my brain with faulty science too. The movie advocates that a low-fat, plant-based diet will combat illnesses. I took it to heart and plunged into this philosophy. Since I was vegan at the time, it wasn’t that difficult to alter my diet. I removed all cooking oils and cooked with water instead. What was the result? I was STARVING all the time! Then I finally did my own research and found that our bodies need fat to thrive. The Fact: Fat does not make us fat. I associated fat in food with fat on my body. This is a big fat fallacy. Fat has a long list of health benefits and we biologically cannot live without it. ►You need fat in order to absorb fat-soluble vitamins, A, D, E, and K.
►Adding fat to each meal maximizes nutrient absorption. ►It also contains the essential fatty acids linoleic and linolenic acid which are needed for brain development, controlling inflammation, and blood clotting. ►Dietary fat maintains the structure and function of all cell membranes in your body. ►Fat boosts hormone production needed for healthy reproductive, stress and thyroid glands. ►It’s the most energy dense food source and sends satiation signals to the brain. Therefore we eat less when we consume fat with meals. ►Fat does not affect blood sugar levels and when consumed with carbohydrates, sugar is released much slower into the bloodstream. ►Your skin’s condition is affected by your fat intake. Fat keeps the skin soft and supple. Now these facts comes with one BIG ole caveat. Not all fats are the same or should be treated equally. Saturated fat is good fat. The nutrition science world recently discovered that their decades of commitment to denouncing animal fat was all wrong. Numerous publications and even media outlets are debunking this school of thought. This year Nina Teicholz‘s published The Big Fat Surprise, where she reveals how the low-fat diet was a failed sixty year experiment on the entire population. Eating saturated fat along with monosaturated and some polyunsaturated fats will support all the bodily functions I’ve outlined above. I mostly use coconut oil, clarified butter, tallow or bacon fat for cooking. Then I reserve olive oil for cold dishes since it is susceptible to rancidity if heated too high. And it’s important to add, that there is a naturally occurring trans fat called conjugated lanolin acid (CLA), which is created in the digestive tract of grazing animals. CLA is found in the fat and milk of these animals. It’s know to fight cancer and support metabolism. There is a moderate category to cover two bases: First, some oils should not be heated above moderate temperatures or they go rancid. Second, you body needs to maintain the right ratio of omega 3 to omega 6 fatty acids to combat inflammation. 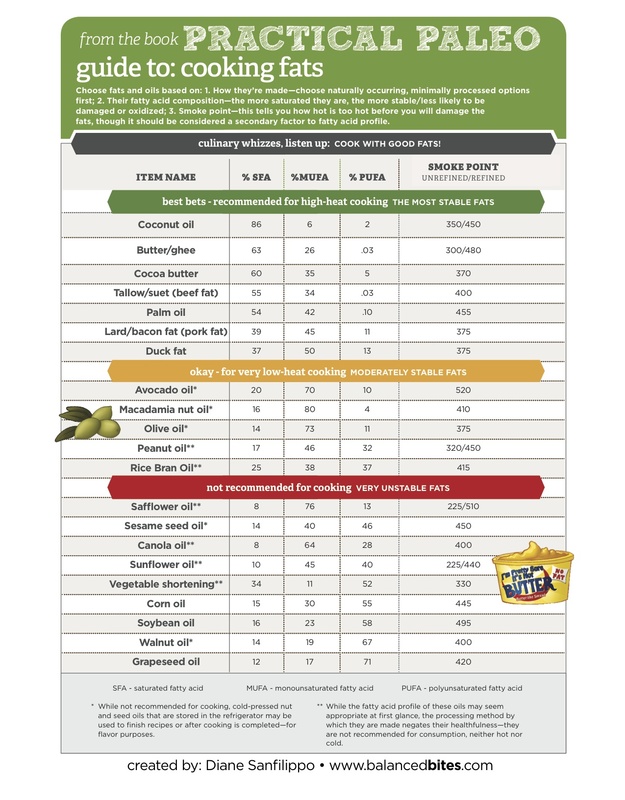 Vegetable oils and nut oils are fragile and highly susceptible to oxidation. They must be processed with care to prevent this from occurring. When they’re exposed to air or light they spoil quickly. This is why quality olive oil is sold in dark bottles and stored in a dark place. The producers know their product will spoil if exposed to the elements. Oxidation is the chemical reaction of oxygen contacting another element. Oxygen molecules actually begin burning the oil. By heating certain oils, your causing the oil to spoil. And when you consume spoiled oil, it develops inflammation in your body. Maintaining the right ratio of omega 3 to omega 6 will greatly decrease the overall inflammation in your body. Consuming too much omega 6 correlates with an increase in inflammatory diseases such as heart disease and type 2 diabetes. Omega 6 competes with omega 3 and can beat out omega 3’s anti-inflammatory effects. According to the University of Maryland Medical Center, the typical American diet tends to contain 14 – 25 times more omega-6 fatty acids than omega-3 fatty acids, which are a result of an abundance of vegetable and seed oils from pre-packaged and fried foods. All the foods listed below should be consumed moderately and balanced with omega-3 rich foods such as oily fish. Human-made trans fats and some polyunsaturated fats are the ones to avoid. We all know human-made trans fat falls into the bad category. But why? They are made by forcing hydrogen into an oil’s structure using a chemical catalyst. The hydrogen increases the product’s shelf-life but also makes it unfit for human consumption. I like how Dr. Eades explains it in The Protein Power LifePlan, “The fats you eat become a part of each and every cell membrane within your body…the trans ones interfere with the functioning of the cell membranes and organs and tissues those cells make-up.” That’s some serious damage being done. Soybean oil, corn oil, canola oil and margarine are among the ugliest of fats and are now tightly linked to the obesity epidemic as well as cancer, heart disease, inflammation and infertility. European countries and many cities across the US have either banned or put limitations on use of trans fats. Polyunsaturated fats in the form of oil have an unstable chemical structure, making them prone to rancidity. They go through highly refined processing that exposes the oil to heat, light and air. All of this exposure spoils the oil. Then it’s bottled up and packaged for consumers and the oil is bad before it’s even stocked on your grocery store’s shelves. 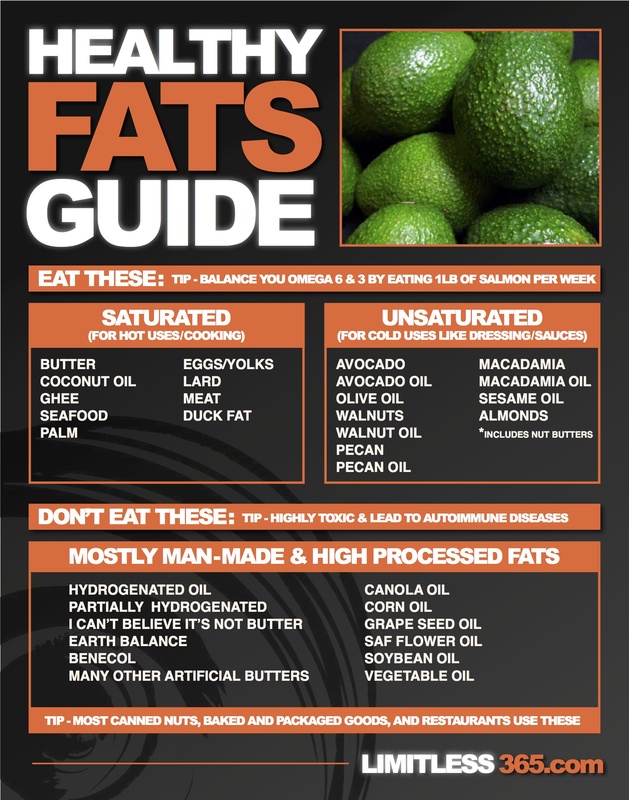 Justin Miller created this Healthy Fats Guide that’s super handy. I also love this guide from Diane Sanfilippo and have it posted in my kitchen as a reminder.